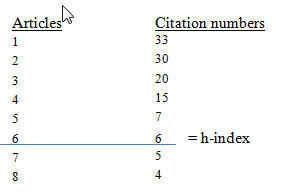 The index is based on the distribution of citations received by a given researcher's publications. Jorge E. Hirsch developed the h-index as a process for quantifying the output of an individual researcher. Hirsch writes: “I propose the index h, defined as the number of papers with citation number ≤ h, as a useful index to calculate the scientific output of a researcher”. How to calculate your h-index? To manually calculate your h-index, organize articles in descending order, based on the number of times they have been cited. For example an author has 8 papers that have been cited 33, 30, 20, 15, 7, 6, 5 and 4 times. This tells us that the author's h-index is 6. An h-index of 6 means that this author has published at least 6 papers that have each received at least 6 citations. The first paper has been cited 33 times, and gives us a 1 (there is one paper that has been cited at least once). The second paper has been cited 30 times, and gives us a 2 (there are two papers that have been cited at least twice). The third paper gives us a 3 and all the way up to 6 with the sixth highest paper. The final two papers have no effect in this case as they have been cited less than six times . If you need assistance with increasing your research visibility, creating a researcher profile or understanding the impact of your research you may contact our Faculty Librarians or the Research Support Librarians.